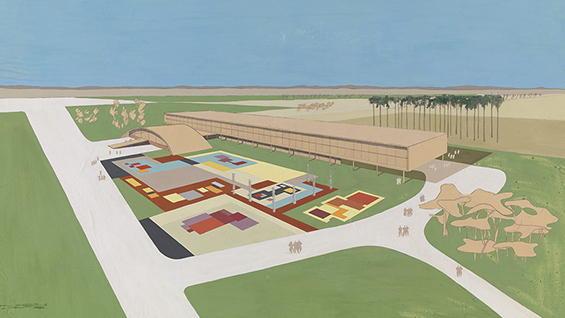 Roberto Burle Marx, gouache perspective of the Geometric Garden, Parque do Ibirapuera, São Paulo, 1953 © Burle Marx Landscape Design Studio/Digital Image © The Museum of Modern Art/Licensed by SCALA/Art Resource, New York. Roberto Burle Marx (1909-1994) is internationally known as one of the preeminent modernist landscape architects. He designed renowned public landscapes in Brazil, beginning with small plazas in Recife in the 1930s and culminating with large public parks in the early 1960s, most significantly the Parque do Flamengo in Rio de Janeiro. Seavitt’s book Depositions explores a pivotal moment in Burle Marx’s career—the years in which he served as a member of the Federal Cultural Council, created by the military dictatorship in the mid-1960s. Despite the inherent conflict and risk in working with the military regime, Burle Marx boldly used his position to advocate for the protection of the unique Brazilian landscape, becoming a prophetic voice of caution against the regime’s policies of rapid development and resource exploitation. Depositions presents the first English translation of eighteen environmental position pieces that Burle Marx wrote for the journal Cultura, a publication of the Brazilian Ministry of Education and Culture, from 1967 through 1974. 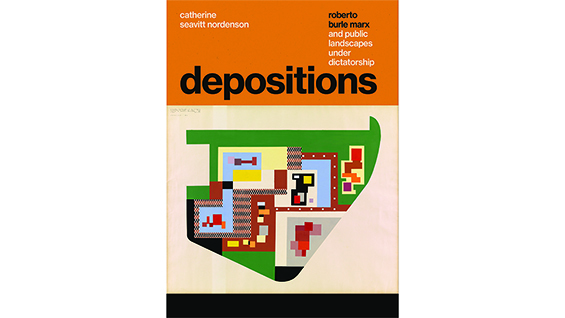 Catherine Seavitt Nordenson introduces and contextualizes the depositions by analyzing their historical and political contexts, as well as by presenting pertinent examples of Burle Marx’s earlier public projects, which enables a comprehensive reading of the texts. Addressing deforestation, the establishment of national parks, the place of commemorative sculpture, and the unique history of the Brazilian cultural landscape, Depositions offers new insight into Burle Marx’s outstanding landscape oeuvre and elucidates his transition from prolific designer to prescient counselor. Catherine Seavitt Nordenson is an associate professor of landscape architecture at the City College of New York. A registered architect and landscape architect, she is a graduate of the Cooper Union and Princeton University, a fellow of the American Academy in Rome, and a recipient of a Fulbright Fellowship for research in Brazil. Her work explores adaptation to climate change in urban environments and the novel transformation of landscape restoration practices. She also examines the intersection of political power, environmental activism, and public health, particularly as seen through the design of public space and policy. Her books include Structures of Coastal Resilience (Island Press, 2018); Depositions: Roberto Burle Marx and Public Landscapes under Dictatorship (University of Texas Press, 2018); Waterproofing New York (UR Books, 2016); and On the Water: Palisade Bay (Hatje Cantz, 2010).